The two strangers, who had taken Hannah from a Shiawassee County courtroom to the motel, then drove her to the Detroit airport where they held a towel over her head and escorted her to an airplane. 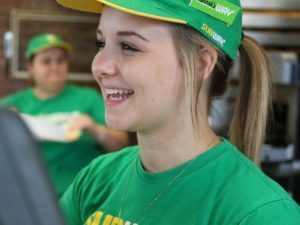 Hannah Mills says she found a job with Subway to support herself after leaving her father’s home. The 17-year-old teen was court-ordered to live with her estranged father, who forced her to attend a California reunification program because he felt Hannah’s mother had alienated her from him.